David could build a model of anything he saw, out of the things young boys have in their cupboards. One day, he receives a mysterious letter, challenging him to build a giant ball. But it is a trick and now it is up to David to save his Mum and Dad and his sister, Sarah. This book is an Aussie Nibble, for children who have just learned to read. 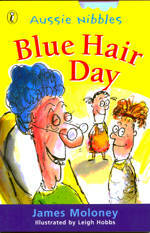 Sonya and Margo hear their grandmother talk about putting a blue rinse in her hair. They decide to do it for her, while she is asleep. They use food dye. Too much food dye. Oh dear. Blue Hair. Get the picture? Mervyn was interested in everything, but most of all he loved animals. And animals loved Mervyn, especially the chicks he discovered at school. But his Mum wasn’t so keen. She wants them out of the house. And worse still, if he can’t find a home for his box full of chicks, they will end up DEAD MEAT! Grommet lives life on the edge. When this gets him into trouble at Scream World, the manager sees an opportunity. Someone has been sabotaging the rides at the theme park. She needs an undercover agent to catch the culprit. And who would suspect a skateboarding teenager like Grommet of being a spy? Jock lives near a park with a large duck pond. One morning he wakes early to the sound of duck calls. But the calls aren’t coming from a real duck. 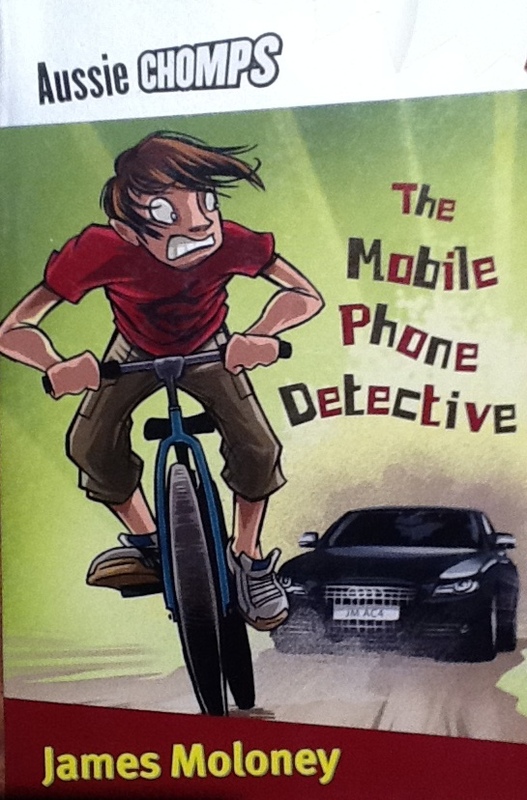 When he investigates, he finds he must act to stop a terrible crime. Be warned – reading this book can be a messy affair! When fourteen year old Jack goes fishing on his family’s isolated cattle property he’s lucky not be caught himself – by a rogue crocodile. To capture the huge reptile, Jack’s father calls in a trapper who gives out a constant stream of facts about crocodile. He captures one, but what he and Jack don’t know is that there is a second one, even bigger. Your blood will race when Jack has to save the crocodile trapper from this terrible beast. Dan and his mate, Joe, love space adventures. They play out fantastic battles in their back yards. Then they find some old walkie-talkies in the garage and play around with the wiring. Suddenly, they find themselves in the middle of a real Intergalactic battle that threatens the entire earth! 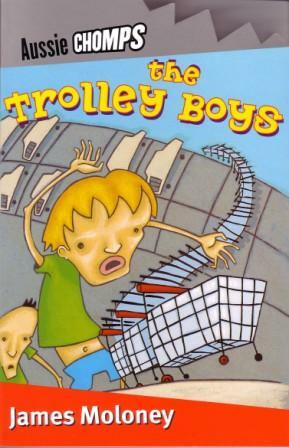 You've seen them - those boys who round up the empty trolleys at super markets and shopping malls. Always sweating, dodging cars and pushing the longest line of shopping trolleys you've ever seen. Brent is one of them. When his mate, Nathan, is fired for damaging the managers BMW, the new guy is no fun. Brent is lonely and bored until a valuable diamond necklace is snatched from the centre of the shopping mall. The police can't work out how the thieves got away with it. Only a pair of trolleys boys can understand their cunning. When Renton flies to France for a holiday with his father, he gets more than he bargains for. Looking for somewhere to have a picnic near the beautiful village of Honfleur he and his dad stumble across some dodgy characters who don't want their faces seen. But it's too late and although they leave quickly, Renton's dad is kidnapped. What can he do to save him when he can't speak a word of French. Worse still, he sees one of the villains at the police station. No, if Renton is going to rescue his father, he has to do it on his own and he has just the weapon to help him. His mobile phone. How does he do it? Well, you will have to read the story to find out - and afterwards, you will never leave home without your mobile. One look at the cover should tell you what the Fishy Frog is. Yep, an old fashion Landrover, complete with fishing rod holders, tackle box on the side and - hey, wait a minute. Those are kids behind the wheel. That can't be right. Driving is a job for grown-ups, not boys still years away from a drivers licence. But sometimes life doesn't play by the rules and when Ben and Ash find their Grandad is dying after a snake bite, it's up to them to him to safety. There's only one way it's going to happen. 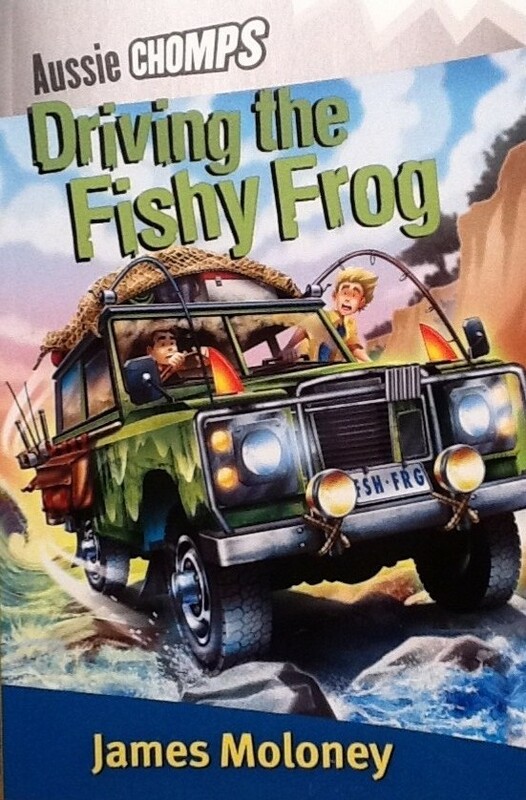 Someone will have to drive the Fishy Frog over the rocks and through the treacherous sand. Will they make it, or will the tide and the surf turn the old Landrover into a battered and rusting wreck.